How will households react to the real income squeeze? Rising inflation is eroding the spending power of UK households’ incomes. How will they react to that? The answer will make a big difference to the economic outlook. Will they dip into savings and carry on buying the same amount of goods and services, or will they just spend the same and be able to buy less with it? New survey evidence suggests that households intend to do a bit of both with nominal spending increasing by around half of the rise in prices but real consumption also falling. But not all households say they will respond in the same way: households with debts and limited savings to fall back on are less likely to be able to increase spending. The depreciation of sterling since late 2015 has raised import prices, and those higher import prices are now being passed into higher consumer prices. When combined with stagnant wage growth that implies that households are likely to see their real incomes stall and not grow at all over the next year, whereas they have been increasing at an annual rate of around 2% over the past few years. How households respond to this squeeze in their real incomes will have important implications for aggregate consumer spending and GDP growth. This was one of the four Key Judgements underlying the MPC’s forecast for the UK economic outlook in their May 2017 Inflation Report. There are two contrasting ways in which households might respond to a real income squeeze. First, they might choose to maintain the quantity of goods and services that they buy (their real consumption) when prices rise by increasing the amount they spend on those items (their nominal spending). But any extra spending will need to be paid for somehow, for example by reducing savings, borrowing more or increasing income in other ways. Second, households might choose to maintain their nominal spending, which would mean that they buy a lower quantity of goods and services and their real spending falls (or alternatively they could buy cheaper goods of a lower quality, which would also imply that real consumption falls). There are theories that could support either response and so it is ultimately an empirical question. Real household spending growth has been weak in previous episodes when rising inflation has squeezed real incomes, for example around 2011. But it is hard to use aggregate data to understand exactly what the response to those real income shocks was because there were also lots of other things happening at the same time. And previous episodes might not be a reliable guide to future ones if households’ circumstances have changed and households in different circumstances respond differently. Directly asking households how they would respond is an alternative approach that can help overcome some of these problems. That is what the Bank of England did in the latest NMG household survey and this post summarises the main results. The NMG survey is now a bi-annual household survey that is commissioned by the Bank (see Anderson et al (2016) for information on the survey). The latest survey was carried out online during the second half of April and early May, covering 6000 households. Households reported relatively strong growth in nominal spending over the past year in the latest survey and they expected that to be maintained over the next 12 months. The net balance who said that they had increased nominal spending over the last 12 months and the net proportion expecting to increase spending next year both increased to their highest level since the questions were introduced in 2015 (Chart 1). 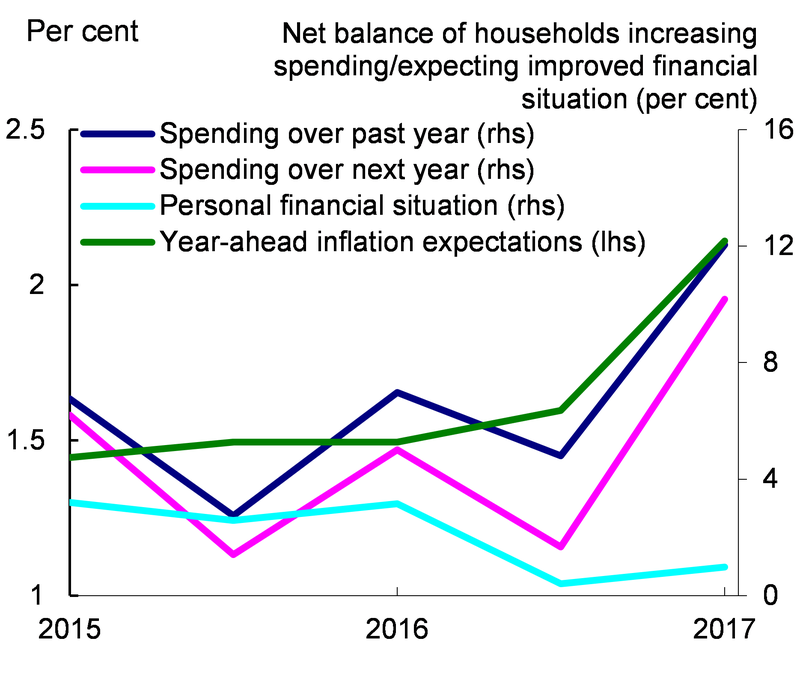 These intentions for higher spending did not appear to reflect households feeling better off as they did not expect much improvement in their overall financial situation over the next year (Chart 1). But they may reflect rising prices: one-year ahead inflation expectations rose from 1.6% in September to 2.1% in April (Chart 1), and perceptions of inflation over the past year rose too. But what we’d like to know is whether nominal spending will rise one-for-one with prices or whether there will be a fall in real spending, and this is where the questions in the latest NMG survey that directly asked households how they would respond can help. Households were asked to ‘Imagine a scenario where the price of all goods and services you buy increased for a sustained period. Imagine the cost of everything – food, clothes, travel costs, getting your hair cut, getting the car washed etc. increased by 5% from tomorrow’ and were then asked how they would respond to that. Households were told to ‘assume your income would not be any higher unless you take action to increase it’. 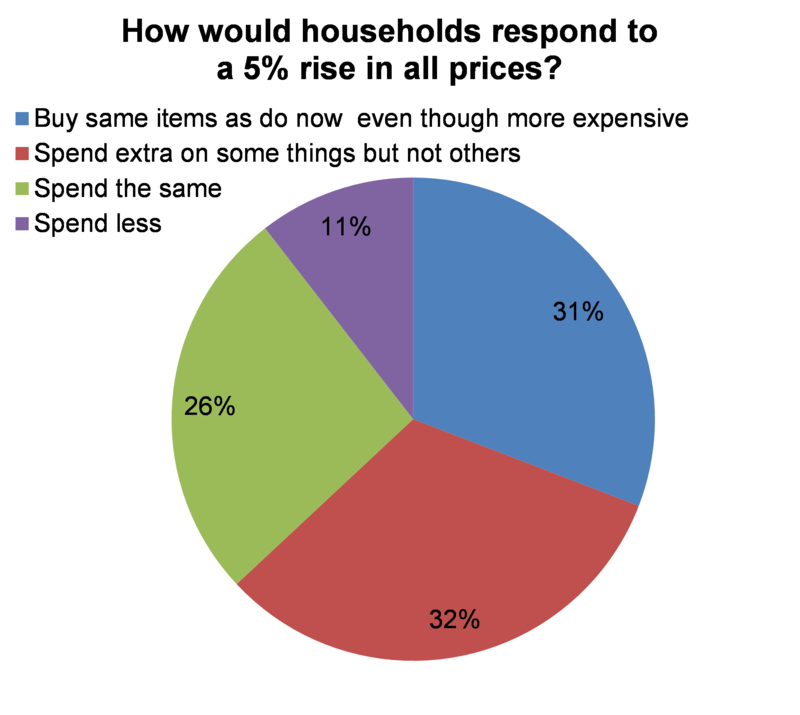 Around a third of households reported that they would buy broadly what they do now in response to a 5% rise in prices, even though it would be more expensive (so increase nominal spending one-for-one), a third would not increase nominal spending at all (or in some cases would cut spending) and a third would increase spending in some areas but not in others (Chart 2). By making assumptions about the amount spending would change by for each of the different survey responses (for example that those who would buy the same items increase spending by 5% and that those who would do a mixture of spending more on some things but not on others would spend 2.5% more) it is possible to estimate an overall effect on both real and nominal spending. Those calculations indicate that a 5% real income fall (caused by a 5% rise in prices) would raise nominal spending by 2.25%, implying that real spending would fall by 2.75%. Assuming that the response was linear would mean that each 1% of real income shock would lower real spending by 0.55%. That is close to previous NMG survey estimates on how households say that they have responded to actual negative income shocks. Among households who would increase nominal spending following a rise in prices, using existing savings or saving less each month was by far the most common way that they expected to finance this and was cited by 60% of respondents (Chart 3). 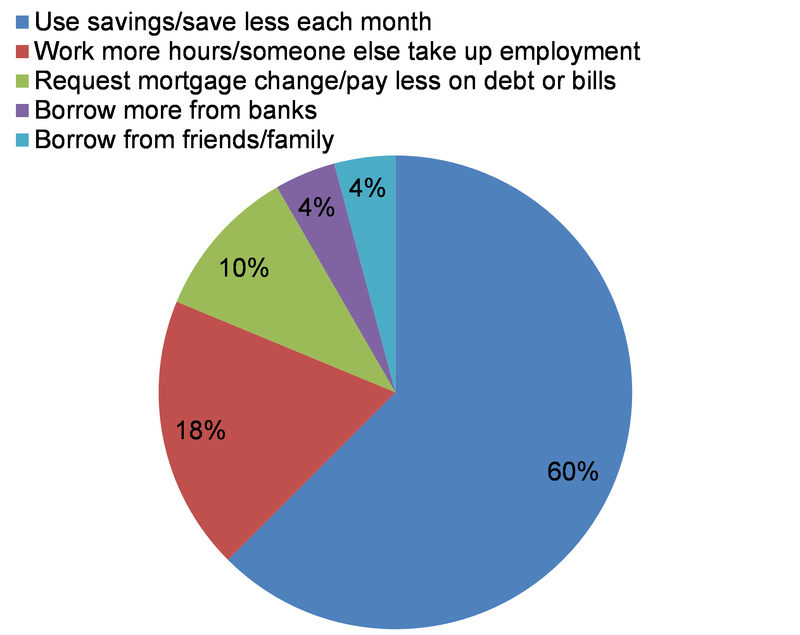 Increasing income by working more was the next most popular response (18%) followed by requesting a change to a mortgage or paying less than required on debts/bills (10%). Only 4% said that they would rely on borrowing more from banks. There were some substantial differences between how different groups of households expected to respond. 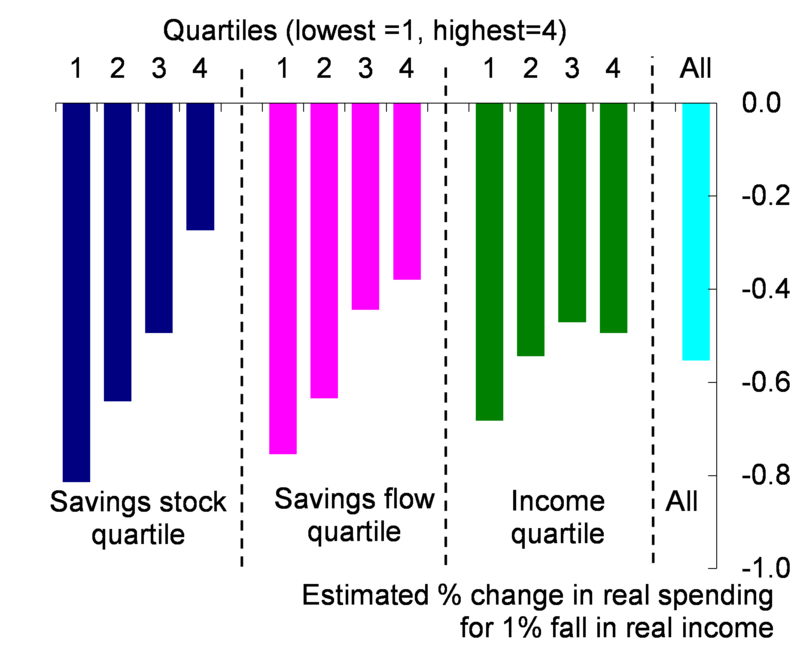 Households with lower stocks and flows of saving reported they would be more likely to cut real spending if prices rose (Chart 4). The 25% of households with the lowest stocks of savings (balances of £250 or less) would reduce real spending by 0.8% following a 1% real income fall, compared to only 0.25% for the top quartile (those with savings of more than £30,000). 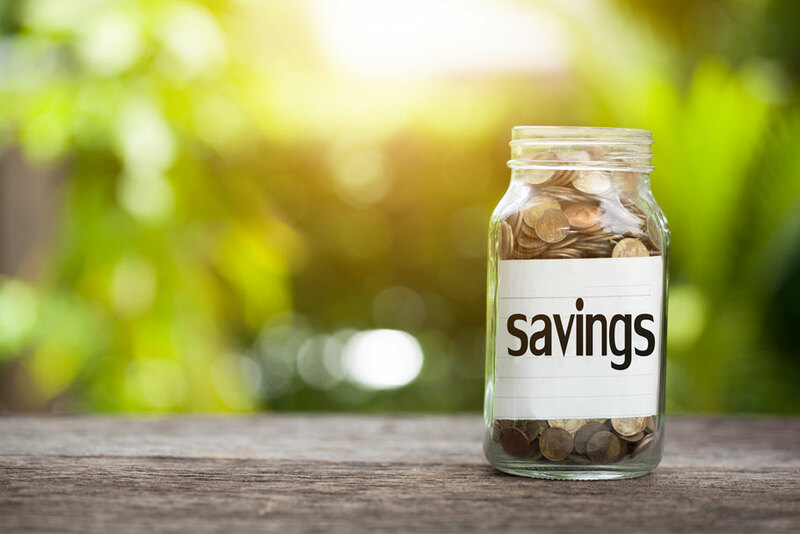 As many of those who would change nominal spending would rely on using savings, this suggests that a lack of savings to fall back on is an important reason why some households would not be able to adjust nominal spending. Households who have lower savings are also more likely to have debt, which is another important factor that may constrain households’ ability to adjust to a real income shock. 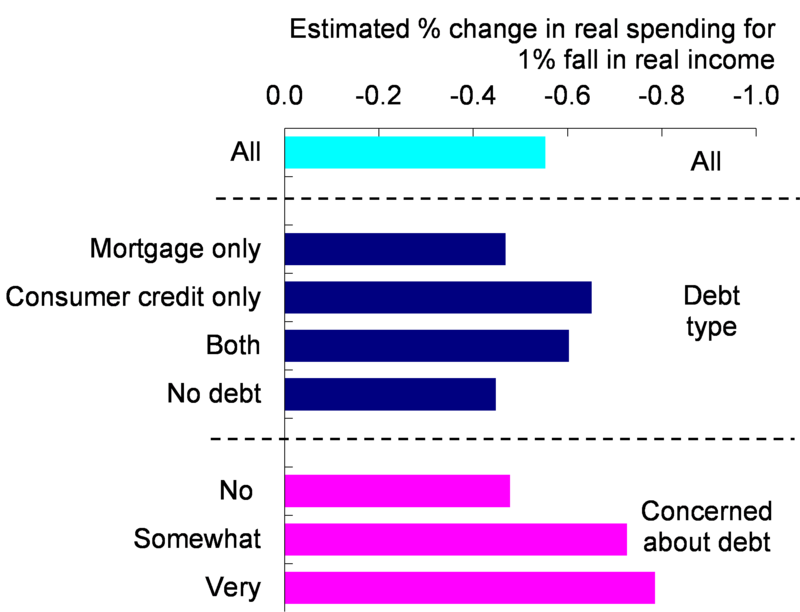 Households with debt, and most notably those with consumer credit, said that they would be more likely to cut real spending in the face of a real income fall, with the effects among those who had debt being largest for those who were concerned about their debts (Chart 5). There was a strong relationship between debt concerns and consumer credit: 95% of households who were very concerned or somewhat concerned about their debt held consumer credit. Where households with debt concerns did say that they would make some increase in nominal spending, they were less likely than average to say that they would rely on savings to fund the extra spending and were more likely to want to renegotiate/reduce their debt repayments or pay less than required. Results from the latest NMG survey indicate that a real income squeeze would lead nominal household spending to increase by around half of the rise in prices, implying that the other 50% would be associated with a cut in real spending. Given that the 5% real income fall asked about in the NMG survey is different to the expected path of real incomes and that there are many other factors that will affect households’ spending decisions, it is hard to be too precise about what this means for the consumption outlook. But it would seem to imply that real consumption growth will be weak, although not as weak as real income growth, and that the household saving ratio will fall somewhat. Philip Bunn works in the Bank’s Structural Economic Analysis Division and Jeremy Rowe works in the Bank’s Monetary Assessment and Strategy Division.